The Emerald Handbook of Public-Private Partnerships in Developing and Emerging Economies is a comprehensive resource bringing together leading scholars to analyze some of the key aspects associated with the processes of designing, implementing, operating, and evaluating PPPs in the context of emerging economies. 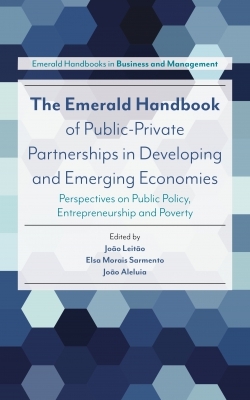 Each contribution discusses ways to ensure PPPs result in the highest value for public money and welfare within the Sustainable Development Goals framework. There are four distinct sections: the first lays the groundwork for a thorough understanding of PPPs in developing and emerging countries; the second explores how to make PPPs work for the poor; the third focuses on public policy, public management practices and entrepreneurship; and the fourth uses practical considerations and case studies to address the implementation and evaluation of PPPs. Individual topics covered include public policy practices and social entrepreneurship; implementation and evaluation of PPPs; empirical analysis of PPP determinants; triggers and determinants to PPP implementation; and guiding principles for PPP sustainability and value for money. With a broad scope and final summary of lessons learned and emerging best practices from a range of case studies, this handbook is a go-to source for researchers and students. Pro-Poor Public-Private Partnerships for Development in Africa: Where Are Local Communities? João Leitão is Assistant Professor at the University of Beira Interior (UBI). He holds a Ph.D. in Economics from the UBI and a Habilitation (submitted) in Engineering and Management from the IST, University of Lisbon, specializing in Technological Change and Entrepreneurship. He is associate researcher of the Centre for Management Studies of Instituto Superior Técnico (CEG-IST), University of Lisbon, and of the Center for Mechanical and Aerospace Science and Technologies (C-MAST), UBI. He is external research fellow at the Small Business Research Centre London, Kingston University, UK; and at the Instituto Multidisciplinar de Empresa, Universidad de Salamanca, Spain.|Elsa Morais Sarmento is a lecturer at the University of Aveiro and external research member at NOVAFRICA, Nova Business School of Management and Economics in Portugal. She holds a BsC and Master in Economics. She has evaluated PPP projects and peer-reviewed PPP related work, and she has published on private sector development, international trade, entrepreneurship, SMEs, and impact evaluation. She has worked for the African Development Bank, European Commission, World Bank, United Nations, Millennium Challenge Corporation, amongst others, in over 70 countries including several developing and emerging economies. She is also a member of the PPP sub-group of the European Evaluation Society.|João Aleluia is a specialist on energy, climate change and sustainable waste management with more than eight years of experience in developing Asia. He is the managing director and co-founder of Singapore-based Volution Sustainability LLP, and he has worked with the United Nations Economic for more than five years, where he supported the establishment of waste sector PPPs in countries such as Pakistan, Sri Lanka or Viet Nam. He holds an MSc in Engineering and Industrial Management (University of Lisbon), as well as a Master’s in Energy Management from ESCP-EAP (Paris), IFP-French Petroleum Institute and BI Norwegian School of Management.